Do you experience challenges with the process of window cleaning around your house? Your struggles are not enough to wipe stains, water streaks and dust build-ups from glass surfaces? The experts of window washing in Turnpike Lane will give you a hand! Say bye-bye to the countless hours of polishing and wiping – the skilled and experienced team members will deal with this matter. You will be able to make the most of your extra time – just let us do this time-consuming and tedious chore for you. Our professional approach will grant you lots of perks. We also provide our professional services in nearby areas: Hornsey Vale, Hornsey, Crouch End, Haringey, Stroud Green. With our abilities and expertise, the great look of your property will be achieved swiftly – the experts of commercial window cleaning will manage with this matter. We use water-fed extension pole system for quick and effective window cleaning, up to the fourth floor. For high-rise office buildings, we use the latest rope access methods. With our gear, we are able to reach the highest glass panes, even on the skyscraper-sized buildings London is so popular with. From small shops to towering business scrapers, we ensure excellent services – call, now! The employees have the experience and the necessary equipment to provide you with both private and commercial window cleaning. You can count on us for all types of glass surface cleaning. 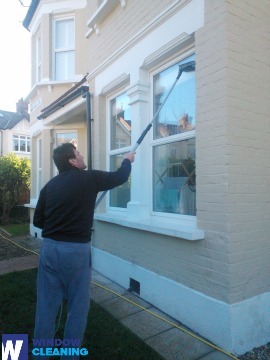 For example, we can wash small or double windows, French doors, sash windows, bay windows and patio doors. Moreover, if you have garden glass surfaces, greenhouse or roof windows, we can clean them as well. We use the latest ways and the latest equipment for all the previously mentioned types of windows. We provide private and commercial window cleaning by using efficient approach. You can rely on our professionalism for all types of glass surfaces, roof windows and conservatories. For windows placed as high as the fourth floor, we use water-fed extension poles. This technique is convenient and allows safe cleaning procedures – the poles are connected to the water reservoir in the vehicle. For high-rise window surfaces, our rope access team will grant you fast and efficient end results. You can gain a lot from these methods right now – just ring 020 3746 3113 and place an order! Take advantage of our residential window cleaning in Turnpike Lane – we provide top-notch services for your home on low prices. We use purified water to clean the windows completely. We stay safely on the ground and clean with water-fed pole system. Find us now - ring 020 3746 3113 or just use our booking form. Our operators will help you book and answer all of your questions. You will love the results of our residential services, we assure you to that!